A wedding dress is the single most important outfit of your life. You’ve thought about this dress ever since you were a little girl. 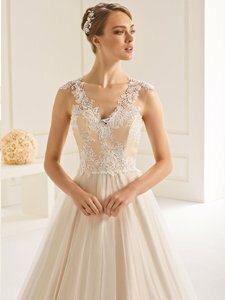 As soon as he popped the question you’ve spent countless hours online, looking for inspo, traipsed around every bridal salon in town with your bridesmaids in tow and tried on almost every gown in the shop until you think you’ve found the one and you’re going to look amazing…….for just one day…… then that beautiful dress is probably going to be shoved in a box in the loft, out of sight, out of mind. Was it all worth it for just one day? Probably! But Audrey Moore, an actress based in Los Angeles, changed this for her friends when she wed in December 2018, the BBC are reporting. “I’m the last one to be married in my group of friends,” she said. “A lot of them told me they were sad they had never worn their wedding dress again”. In a moment of what we can only say is sheer brilliance, Audrey came up with the idea she could use her own wedding to give her friends an excuse to get their old dresses out of the box in the loft. Would you be worried that you would be upstaging the bride? Audrey wasn’t in the slightest bit concerned. She wore a gorgeous blue wedding dress by Adela Customdesigns so she stood out from the crowd of brides. We made it to the top of the front page of Reddit so you are all famous now! @circumpunctstudio — I told you! You might not want to have all your squad turn up in wedding dresses but if you are looking from a break from the traditional ivory gown, like Audrey, you can find some beautiful and colorful gowns in Copplestones Bridal.